Passbolt instead of a classic form based authentication perform a challenge based authentication based on OpenPGP keys set during the setup. The aim of this document is to help explain how this authentication process works to facilitate review and discussions as well as future integration with other products. Our goals were both to improve the security and usability of the overall solution, e.g. reuse the existing OpenPGP facilities of passbolt to avoid having the user remember another password than their passphrase. While some web application today defer to another service such as Google or Facebook to handle the authentication, most still support a form based authentication by default. During the registration, the password is sent (ideally over HTTPS) to the server. This password is then salted and hashed using bcrypt (or equivalent) and stored for further use by the server. A salt known only by this application instance is used to prevent brute force in case the password’s hashes get leaked (via a sql injection for example). During login is sent in a similar fashion than the setup, the server hash it and compare it with the stored version. If they match the server store a session token that is send back as a cookie (or url parameter) and set on the client side. This cookie is produced by the client for each requests for the duration of the session (until the cookie expires, the user logout or the server terminate the session). The main issue is one of usability. Using this approach for passbolt would mean that a user would need to remember another password on top of their private key password. This negates the benefits of having a password manager. We would also store the password in the authentication plugin. But this would complicate our requirements as it would introduce the need for passbolt user account password creation, update and recovery. Another big issue is the inability for the user to reset their password using an email verification, in case the password to the email client is stored in passbolt. Phishing: it is possible for an attacker to mimic the passbolt login page and trick a user into entering their credentials. Traditional form based authentication do not perform server identity verification: it is the responsibility of the user to verify if the URL is correct and SSL certificates are valid. Password quality: password fatigue generally leads to password reuse, poor rotation and weak strength. Validation can be implemented server side to improve password quality but only by placing an additional burden on the user. This process will follow the gpgAuth protocol. 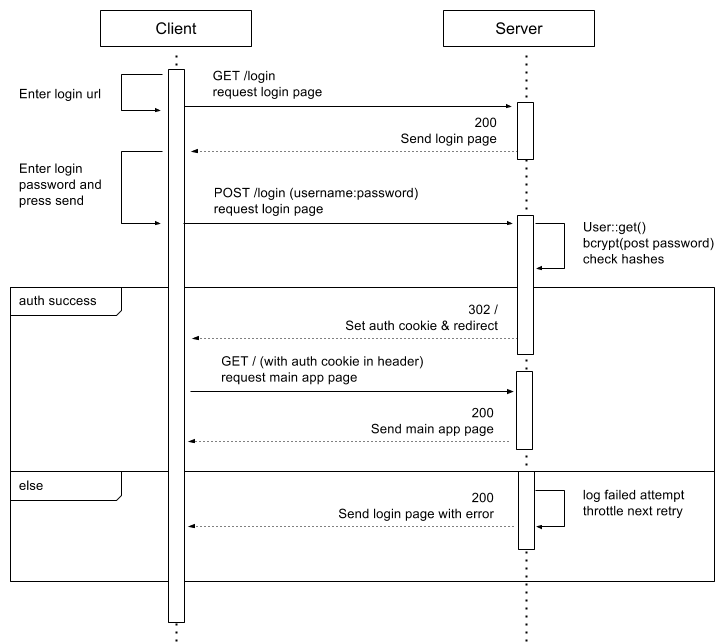 This authentication mechanism uses Public/Private keys to authenticate users to a web application. The process works by the two-way exchange of encrypted and signed tokens between the user and the service. The client generates an encrypted token of random data (encrypted with the server public key), and stores the unencrypted version locally. That encrypted token is sent to the server along with the user key fingerprint. Based on the user key fingerprint the server check if the user exist and is active. If it is the case the server decrypts the nonce and check if it is in the valid format. The server sends back the decrypted nonce. The client check if the nonce match the previously recorded one. If it does not match the client warns the user that the server identity cannot be verified. This server identity verification should not be understood as an end to end server authentication, e.g. it does not protect against an attacker performing a man in the middle attack. View the discussion around this topic on the community forum. The user sends their key fingerprint. The server checks to see if the fingerprint and user associated with are valid. It then generates an encrypted token of random data, and stores the unencrypted version locally. The server sends the unencrypted signed user token, and the encrypted server token to the user. The user enter their private key passphrase, the client decrypt the nonce and check the token format. The client send back the decrypted nonce along with the user key fingerprint. The server compares the un-encrypted signed token sent from the client to make sure it matches. If the server is satisfied, the authentication is completed as with a normal form based login: session is started. As per protocol definition the server key verification steps are optional but recommended all our client enforce it by default. We decided to stick to the historical version of the protocol for now, but in the future we may try to reduce the number of HTTP request: e.g. currently one can not request nonce1 in the verify step. So with the verify step a total of 3 POST are needed. The whole protocol could probably be simplified to single GET/POST roundtrip, like for form based auth. There is also an optional “step 0” where the user perform a GET /auth/verify request. This can be used to get the URLs of the server public key and server verification, or to view the public key advertised by the server. Phishing: this risk is mitigated because the client does not enter a password, e.g. getting the secret key passphrase alone would not allow an attacker to login. Since the client can verify the server identity based on server key (manually added to the keyring), it is not enough for an attacker to fake a form and domain. Password quality: the strength of the authentication token is stronger than a classic password, since a different “password” is also used every time and is not linked the private key master password complexity. 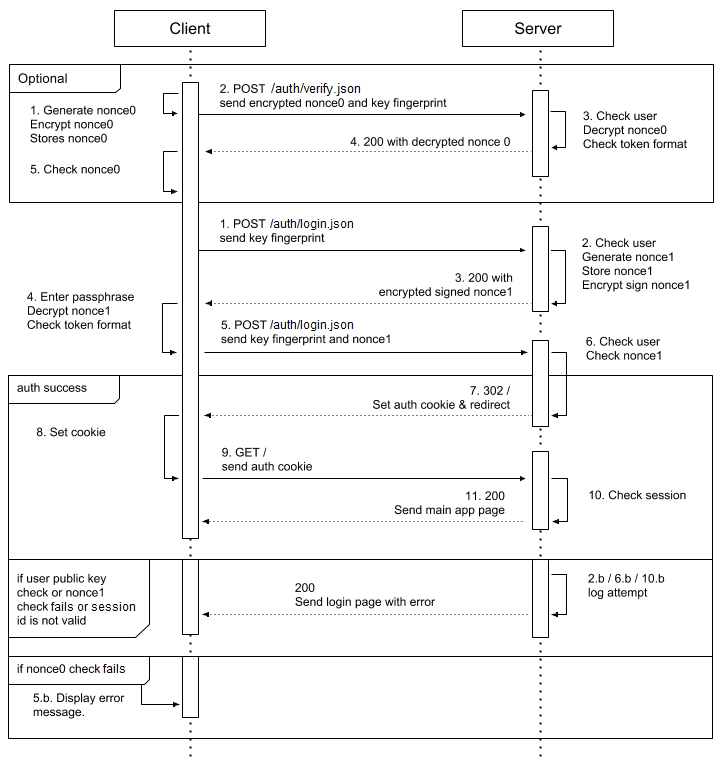 Server: integrity and verification of client public key validity. A server could be tricked into storing the wrong client public key. To prevent this the server must check the validity automatically via OpenPGP web of trust and/or by checking against public key servers and/or there must be a manual check by an administrator. This check is not in place at the moment. Server: DDOS. Since encrypt / sign operations are more costly than the password hashing operations in a “normal” form based login, these endpoints could potentially be used to create a denial of service. To mitigate that risks we throttle attempts, e.g. limit the number of attempt over time. This check is not in place at the moment. Server: information leak about user base. An attacker can find out if a user have an account on the server by requesting an encrypted nonce and receiving an error. We also leak information in the header to improve usability and provide better error messages: for example to tell a user that their account was delete for example. Client: integrity and verification of server public key. The client could be tricked into storing invalid server key. To prevent this the client must check the validity (as in previous case) during the setup. Similarly during the setup the client must also check domain / key mapping in case someone is creating a real key with a fake but very similar domain url. This is implemented at the moment, but could certainly be improved as the end user can still make a mistake and not check properly. Client/Server: the client/server can be tricked into decrypting and returning/signing wrong data, for example an email previously captured by an attacker. To mitigate this the encrypted format message is fixed (e.g. a UUID) and signed by the server. Client: the authentication cookie can be stolen if SSL can be broken. This is not specific to this authentication method, as form authentication is also vulnerable to this class of attack. Both: Key revocation and expiracy. There is no facility at the moment to replace and revoke keys. This article was last updated on January 20th, 2017.